MWC19 Takeaways: Forget the 5G hype, IoT is already here! This year, the Altair team once again headed off to Barcelona for Mobile World Congress. 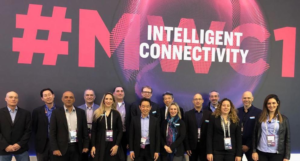 With more than 100,000 attendees from almost 200 countries, and over 2,400 companies showcasing the latest products and innovations, MWC continues to live up to its reputation as the world’s premier mobile technology convention. 5G for IoT? It’s Already Here! If the show revealed anything at all it’s that, two years after it was first introduced at MWC 2017, 5G’s hype shows no sign of abating. And for four days straight, it seemed that everyone was trying to get in on the game. Once again, there was no shortage of excitement and speculation, with companies showcasing a seemingly inexhaustible range of 5G products and services. However, perhaps most interesting was the realization that, while the smartphone industry is steadily heading towards 5G, as far as the IoT market is concerned, we are already there. Thanks to the recent advances of cellular IoT technology and the proliferation of LTE Cat-M and NB-IoT solutions, today’s IoT devices are already 5G-ready and will not require the great revolutions on the device side we are now seeing with 4G broadband technology. In contrast to the ongoing hype around 5G, IoT conversations were practical, with tangible planning and information being exchanged. The inflated expectations of previous years have been replaced with serious discussions about future deployments and resolving the remaining challenges in bringing products to market. And from both device makers and network providers, the message was clear: We are all ready for the mass rollout of cellular IoT solutions today. Perhaps the most significant takeaway from our numerous conversations was establishing that, above all else, power consumption and security will play significant roles in the future success of IoT deployments. From smart meters to wearables, health monitors to vehicle telematics, players are looking for the same answer – a mature all-in-one solution offering the longest battery life combined with the highest levels of integration and security. The future of the IoT? It’s already here!